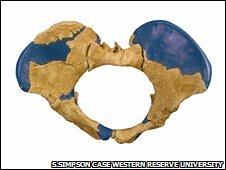 A new Homo erectus fossil suggests that females had large, wide pelvises in order to deliver large-brained babies. Being born with a larger brain meant our ancestor became independent far more quickly than modern human infants. The new finding, published in Science magazine, conflicts with earlier ideas that suggest they had a tall, thin body shape adapted for running. Homo erectus is thought to be the first human-like creature to move out of Africa to colonise the world. The now extinct hominid species may also have been the first to control fire. The near-complete 1.4 million-year-old female pelvis was found near Gona in northern Ethiopia. As it was pieced together, the archaeologists were struck by the unusual width of the pelvis. Scott Simpson, a palaeontologist from Case Western Reserve University in Cleveland, Ohio, US, was one of those who made the discovery. "Proportionally her hips are wider than those of modern humans," he says. Pelvis size indicates how large the newborn's head could be. Earlier hominids such as the three-million-year-old Australopithicus afarensis, made famous by the "Lucy" skeleton found in 1974, have a much narrower pelvic opening. In comparison, more recent hominids found in China, Israel and Spain have wider pelvises. 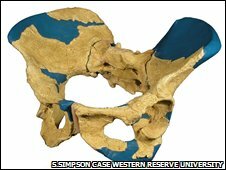 The researchers say the wider pelvis meant H. erectus could have given birth to babies that were 30% bigger than previously thought. Having a larger brain size meant the young hominid was dependent on its mother for less time than a modern human baby, a useful survival adaptation in the African savannah where they lived. The researchers say the erectus brain probably grew quickly before birth; but after birth, growth-rate then slowed to somewhere between that of modern humans and chimpanzees. But Dr Simpson points out that H. erectus was much more like a human than a chimp. "Homo erectus was the first hominid species that left Africa; they were technologically sophisticated with stone tools; they hunted animals. Many behaviours we consider unique to [modern] humans were present in Homo erectus." The new finding casts doubt on the accuracy of previous theories about Homo erectus. The most famous H. erectus find is the "Turkana Boy", a young male discovered in Kenya in 1984 . His reconstructed skeleton - with a narrow pelvis and tall, thin body - is interpreted as showing adaptation to the hot climate and the need to run long distances. In comparison, this new find is from a shorter female with a wider chest - a feature more commonly found now in humans from colder, even Arctic climates. The wide pelvis suggests the birth canal and brain size were co-evolving, as H. erectus adapted to the need to give birth to larger babies above the need to adapt to the pressure of external environmental factors.